No, I’m not speaking to my kids, actually. I’m speaking to both sides of the “culture wars” being fought in the U.S. right now. You know who you are. On the other hand, we have the LGBT groups boycotting the Salvation Army for the reverse reason. The Salvation Army is one of the biggest charity organizations around. They help enormous numbers of people. They are have one of the lowest overhead cost of any charity, which means more of your dollar goes to actually help people (as opposed to going to advertising mailers and salaries), and they are extremely well rated at Charity Watch. But – sorry, homeless folks. No Christmas dinner for you, because we’re boycotting this charity. We’ve already established that I’m not talking to kids, right? This is America and not everyone agrees on everything … and most of us think that’s a pretty good thing. If you personally don’t like the Salvation Army, or Home Depot, or the corner store, then don’t take your money there. But seriously, grow up and play nice and quit the boycotts. Quit trying to drive everyone out of business who doesn’t agree with you. Guess what, you’ll never have everyone agree with you! So quit the name-calling and the “you can’t just tolerate me, you must agree with me” crap. Next time you’re asked to join a boycott, ask yourself: Who is being helped? Who is being hurt? Am I hurting real people just to make a political point? And, practically speaking: Is forcing my agenda onto people who don’t want it actually going to help or hurt my agenda in the end? 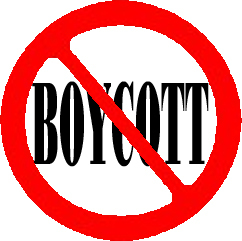 Let’s boycott the boycotts, because I can tell you then end of this war if you want to hear it: No one wins. I never did understand how boycotting could make a difference. I have no idea. It doesn’t seem to bear much resemblance to sitting down and eating with the sinners as Jesus did, does it? So true, Carma. I am so pained by the hatefulness of “Christians” who bash gays. It’s such a double standard. If we really cared about sexual purity we would boycott Hollywood movies and television that are full of sexual immorality. It seems that if the immorality is hetero, then it’s okay. NOT! It’s all sexual sin. Let’s get honest and real.